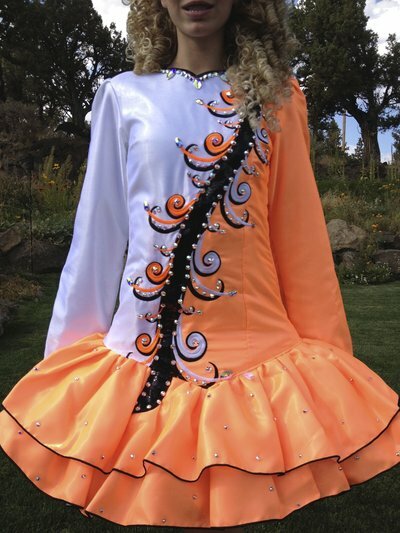 Striking orange and white Shauna Shiels dress for TALL dancer. 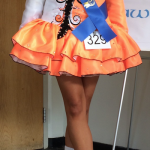 My daughter was 5′10 when she got the dress and it still fits her at 5″11. Beautifully made and very light. Stands out on stage. 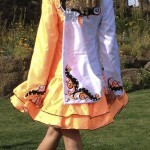 Back of neck to bottom of skirt – 34.5″ there is a lot of room for let out in the width. Not so much in the length. Asking Price: $US1100 OBO. Shipping costs are included for my own country, overseas shipping is extra. Sale is final.